Bold new TV comedy casts five transgender stars, takes on Trump's America. Poster image for "The Switch: Work Love Mortal Danger"
The first transgender sitcom in the history of television, "The Switch: Work, Love, Mortal Danger" is coming to iTunes, Google Play, Revry, and Amazon this summer. Season One of The Switch follows the story of Sü, a trans woman who flees Trump’s America with the dream of coming out and restarting her life in Canada - only to wind up couch-surfing with her ex, Chris, an adorable ecoterrorist. What follows is a journey of self-discovery and empowerment, as well as dodgy employment, dumpster diving, nosy cops, murdered oil lobbyists, sci-fi hallucinations, and a problematic boyfriend. It’s unashamedly geeky, defiantly hopeful, and proudly political, and above all, it’s funny. 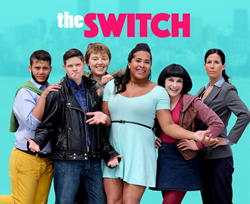 The Switch is the first TV show with a transgender actor in the starring role, and the first to have a transgender showrunner - not to mention five trans and/or non-binary lead actors and similar crew. Its diverse cast stars pro wrestler Nyla “The Destroyer” Rose, political humorist Amy Fox, drag king Lindsay Coryne, thespian Vincent Viezzer, agitator Chance Kingsmyth, APTN star Andrea Menard, and heartthrob Kent S. Leung. The first season was directed by Jem Garrard of Artaban Productions. Showrunner Amy Fox and producer Ingo Lou run Trembling Void Studios. On their seven-year journey to create The Switch, they also produced Time-Warner’s revenge thriller La Quinceañera, and Tear Down the Wall for MTV, among other aggressively diverse indie projects. Film and TV “about” the trans experience such as The Danish Girl, Transparent, and 3 Generations lacks transgender stars, producers, and often creatives. The Switch changes that by proving that great TV should, can, and now does reflect the real range of humanity. It launches on REVRY June 13th, Amazon on June 19th, iTunes on June 30th, and Google Play on July 15th. FOR JOURNALISTS: Trembling Void editing staff are happy to cut video or audio content for exclusive use. Onsite taping facilities are available to record remote interviews. The Switch - Work, Love, Mortal Danger. Set Stills from transgender sitcom "The Switch: Work, Love Mortal Danger"In addition to cast in poster, 142(2) features Kent Leung as "Russell," and 244 features Raugi Yu as "Nate" The transgender TV sitcom The SwitchIn addition to cast in poster, 142(2) features Kent Leung as "Russell," and 244 features Raugi Yu as "Nate" The transgender TV sitcom The SwitchIn addition to cast in poster, 142(2) features Kent Leung as "Russell," and 244 features Raugi Yu as "Nate"